God of War: Chains of Olympus is a third-person action-adventure video game developed by Ready at Dawn and Santa Monica Studio, and published by Sony Computer Entertainment (SCE). It was first released for the PlayStation Portable (PSP) handheld console on March 4, 2008. The game is the fourth installment in the God of War series, the second chronologically, and a prequel to the original God of War. It is loosely based on Greek mythology and set in ancient Greece, with vengeance as its central motif. The player controls Kratos, a Spartan warrior who serves the Olympian Gods. Kratos is guided by the goddess Athena, who instructs him to find the Sun God Helios, as the Dream God Morpheus has caused many of the gods to slumber in Helios' absence. With the power of the Sun and the aid of the Titan Atlas, Morpheus and the Queen of the Underworld Persephone intend to destroy the Pillar of the World and in turn Olympus. God of War: Chains of Olympus is a third-person single-player video game viewed from a fixed camera perspective. The player controls the character Kratos in combo-based combat, platforming, and puzzle game elements, and battles foes who primarily stem from Greek mythology, including cyclopes, Gorgons, satyrs, harpies, minotaurs, hoplites, and sphinxes. Morpheus beasts, shades, banshees, fire guards, fire sentries, hyperion guards, and death knights were created specifically for the game. Platforming elements require the player to climb walls, jump across chasms, swing on ropes, and balance across beams to proceed through sections of the game. Some puzzles are simple, such as moving a box so that the player can use it as a jumping-off point to access a pathway unreachable with normal jumping, but others are more complex, such as finding several items across different areas of the game to unlock one door. Kratos' main weapon is the Blades of Chaos: a pair of blades attached to chains that are wrapped around the character's wrists and forearms. In gameplay, the blades can be swung offensively in various maneuvers. As the game progresses, Kratos acquires new weapons—the Sun Shield and Gauntlet of Zeus—offering alternative combat options. Kratos only learns three magical abilities, as opposed to four in previous installments, including the Efreet, the Light of Dawn, and Charon's Wrath, giving him a variety of ways to attack and kill enemies. He acquires the relic Triton's Lance—similar to Poseidon's Trident in God of War— which allows him to breathe underwater; a necessary ability as parts of the game require long periods of time there. 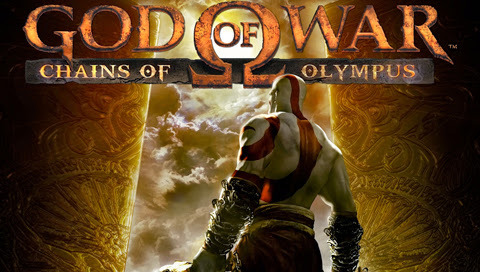 Then download GOD OF WAR CHAINS OF OLYMPUS PSP ISO ROM. Run PPSSPP app and select your GOD OF WAR CHAINS OF OLYMPUS PSP ISO ROM.